The Ottoman chronicles recount that the first sultan, Osman, dreamt of the dynasty he would found -- a tree, fully-formed, emerged from his navel, symbolising the vigour of his successors and the extent of their domains. This is the first book to bring the full story of the Ottoman dynasty -- and its empire and peoples -- to a broader readership.Osman's descendants combined the resourcefulness of their nomadic origins with the imperial world-view of conquered Byzantium. The result was a multi-ethnic state that for six centuries held sway over territories stretching -- at their greatest -- from Hungary to the Persian Gulf, and from North Africa to the Caucasus. 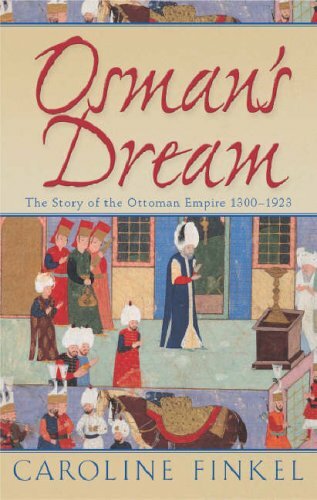 The Ottoman path to modernity was every bit as complex as those of the Habsburgs or Romanovs.Understanding the realization of Osman's vision over the many centuries when the Ottoman Empire controlled the centre of the globe is essential for anyone who seeks to understand the modern world. Caroline Finkel has lived in Istanbul for many years and travelled widely in Turkey and the former Ottoman lands. She has a doctorate in Ottoman history from the School of Oriental and African Studies and has published numerous articles. She has studied Hungarian, Arabic and Persian in addition to Ottoman and modern Turkish. Osman's Dream is her third book.